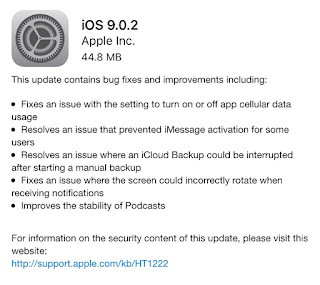 Today, Apple has rolled out iOS 9.0.2. The 45MB update addresses a few minor issues with the new mobile operating system. The unreported security update is the main reason why you will want to apply this update. According to enthusiast blog AppleInsider, the unreported fix addresses a vulnerability with the lock screen security. "...[T]he iOS 9.0.2 update issued today fixes a security issue that allowed malicious users to bypass a passcode protected lock screen and gain unfettered access to an iPhone's photos and contacts." iOS 9.0.2 is available now for all devices that are running iOS 9, iOS 8 and iOS 7 via the Settings application > General > Software Update.